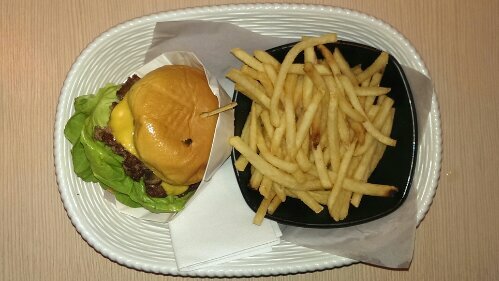 Omakase Burger @The Grandstand (Singapore) | Get Your Grub On! It’s getting crowded on the podium. I often read about this place but didn’t pay too much attention to it because it is a bit out of my way and because it just looked like another franchisy burger shop to me. Recently it had gained increasing popularity and was also voted amongst several “Best Burger in Town” lists and since I was on the road anyway I decided to take a little detour from my way home and give this one a shot. When there, I wasn’t too impressed by its’ looks nor by the help-yourself-condiments-station but didn’t let that hold me back from ordering their ‘Bacon Cheese Burger‘. Looked quite normal and pretty small to me, especially for the seventeen bucks that i’d just paid but a second later all this didn’t matter anymore as this was one of the best freaking burgers I have ever eaten, inhaled actually might be a more suited description. The homemade bun was pretty small for sure and a bit too buttery for me but this patty was nothing else than perfect. It was crispy charred, almost like a crust on the outside and full of juicy meat on the inside. The texture was great and it was so good and had such a natural and ridiculous beef flavor that it somehow actually made me really happy. All the other stuff on that bun was great too, thick and gooey melted cheese and the salty crispy bacon, but that beef patty was really something else. Location is off and inconvenient, the setup like at any other fast food joint nothing special and the menu is less inventive than others but oh that burger! Looks like DeBurg just got themselves some serious competition.